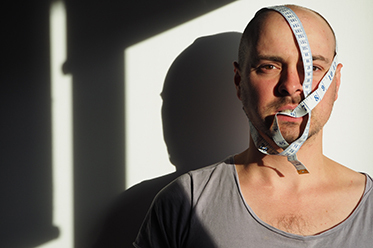 Promising to be another powerful, engaging, and highly entertaining work by one of Melbourne’s critically acclaimed artists, Gavin Roach returns to Midsumma with the second instalment of his Anxiety Trilogy – The Measure of a Man, at Gasworks Arts Park from 1 February 2016. I don’t think my story has any more gravity than anyone else’s, but if it gets people talking then I don’t see that as a bad thing,” adds Gavin. A graduate of the Bachelor of Arts (Acting for the Screen and Stage), the Bachelor of Arts (Acting for the Screen and Stage, Honours) at CSU, and the Masters in Arts Management at UTS, 2015 saw Gavin commence his Masters in Writing for Performance with VCA. Gavin’s previous productions include Confessions of a Grindr Addict, Any Womb Will Do, and I Can’t Say The F Word, all of which he wrote and performed in, and which have celebrated sell out seasons and national and international tours. His latest premiere season, The Measure of a Man is presented as a part of the 2016 Midsumma Festival and promises to be another powerful, engaging, and highly entertaining work by one of Melbourne’s most lauded Queer artists.